Cutout: 13.56" W x 12.81" D x 5.5"
The Origo 2000CB has the practicality you want. 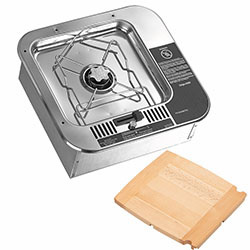 The compact design of this pressure-free, drop-in single-burner stove takes minimum counter space, yet allows, ready access for your cooking needs. That's why boating enthusiasts the world-over depend on Origo, the most trusted name in marine appliances. 1 qt. 8 1/2 ozs.